In the morning, we walked over to the Hofburg palace, which houses the Spanische Hofreitschule, or Spanish Riding School, where the Lippizaner stallions perform. Granny wanted to watch the morning exercises, which are much cheaper to view than the full performances, although you cannot book seats. We were amongst the first in the queue and so we ended up getting very fine seats on the lower balcony. I was impressed that Keiki and Humuhumu maintained interest in the exercises for a full hour. Each set of horses practised only for half an hour, to avoid straining them. A little film was shown about the birth and development of the horses as they took their turns around the sandy floor. Keiki was fascinated by that, particularly the way the horses changed colour. 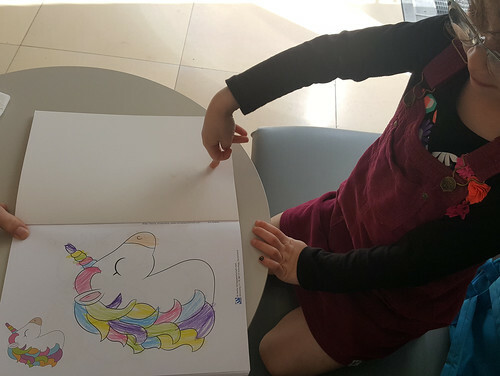 Humuhumu got out her drawing pad and pens from her Rainbow Dash rucksack and did some drawings, which I later realised were based on the architectural flourishes inside the building. If you’re wondering why there are no photos, it’s because all photography and filming within the building is forbidden. 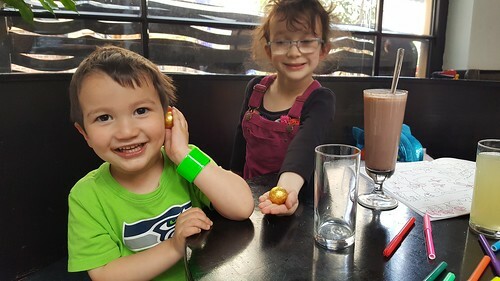 The grandparents wanted to stay and watch another round of exercises, so I took the children to the cafe to wait for them. We ordered our drinks, and the waiters brought us not only those but also colouring books for Humuhumu and a few toys for Keiki. I had forgotten that most cafes in Vienna have a box of things to keep the children amused. 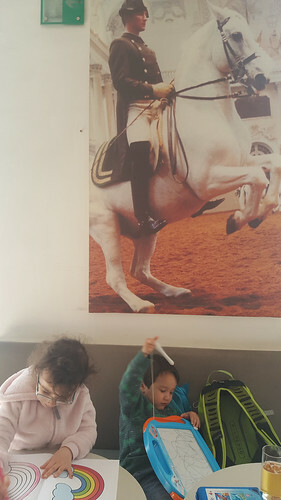 Humuhumu colouring and Keiki playing with a magnetic drawing board, beneath a large faded photo of a Lippizaner and his rider in full dress. 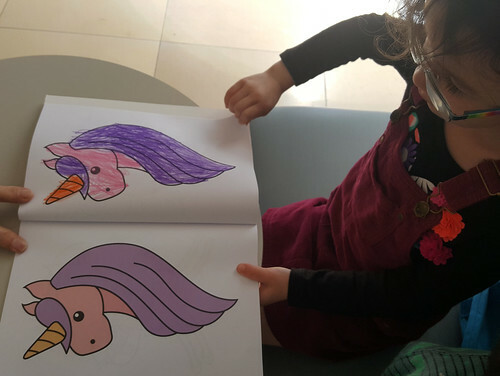 We spent about an hour in the cafe, which gave Humuhumu plenty of time to colour in all the ponies in the colouring book. This was the pink & purple pony. And, of course, the rainbow pony. 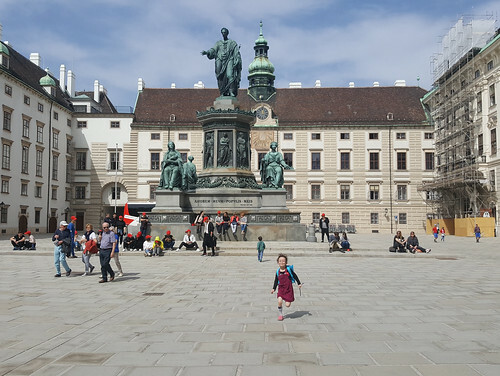 Once we’d reunited with the grandparents, we ambled slowly back through the grounds of the Hofburg. Well, the adults ambled. The children ran, and visited all the statues. 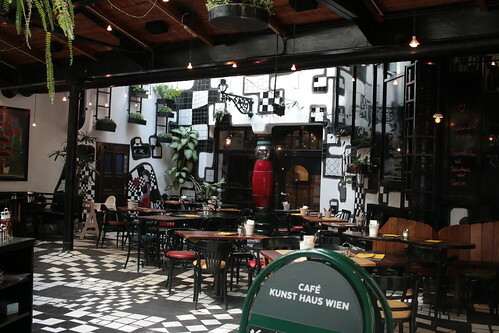 After lunch and a rest, the children and I went out again to take a long tram ride over to the Kunst Haus Wien, one of Hundertwasser’s buildings, and a fine gallery. I have seen a couple of outstanding exhibitions there, one of H.R. Giger and the other of street photography pioneer Saul Leiter. The exhibition at the moment is the work of Finnish photographer Elina Brotherus. 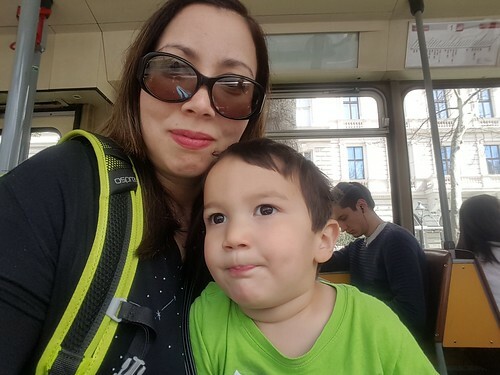 Keiki and Mummy on the tram. It was one of the old-style ones with wooden seats. 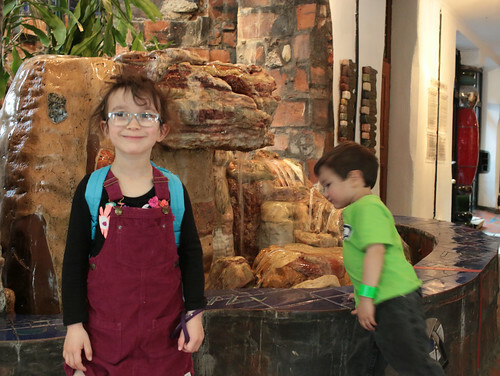 The children liked the self-portraits taken by Elina Brotherus, but they were most taken with the building itself, with its wonky floors and myriad mosaics of coloured tiles. Here they are next to the fountain in the lobby. Another version of the photo in the cafe with the Mozartkugeln. The cafe interior. Most of the patrons were sitting outside because the weather was so nice, but it was a bit windy. We chose to stay inside so Humuhumu could draw without her pens blowing around. 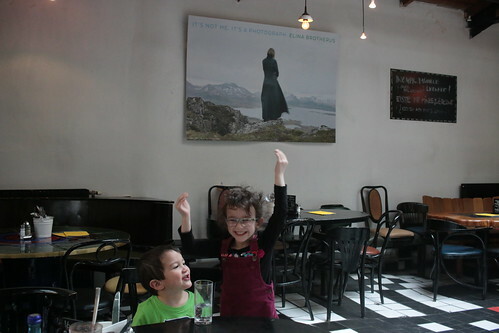 Keiki and Humuhumu mucking about under one of Elina Brotherus’ portraits. 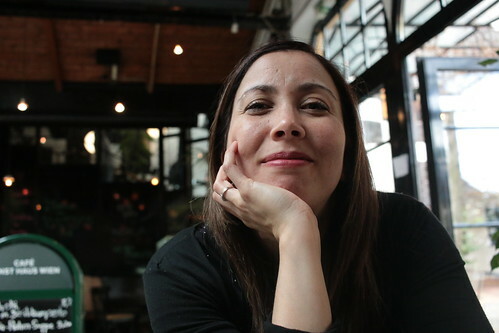 It must have inspired Humuhumu because she took this portrait of me a few minutes later. We took the tram home again, satisfied with the day’s adventures. Once the bloke had returned from the conference, we ventured out into the night in search of a quiet drink. 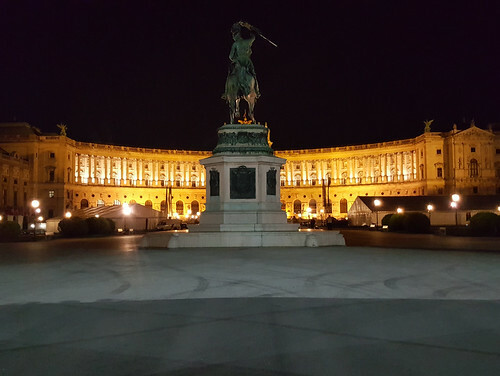 The grounds of the Hofburg were exceptionally attractive by night, and also oddly deserted. 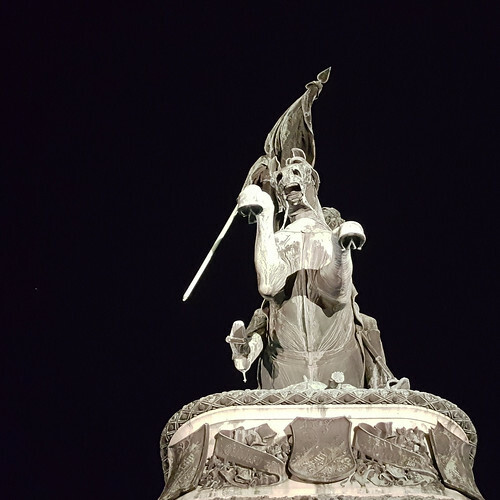 The lighting on the statuary was quite dramatic. Horse rampant! We ended up at the Museumsquartier, where the big purple loungers in the courtyard were crammed full of people. 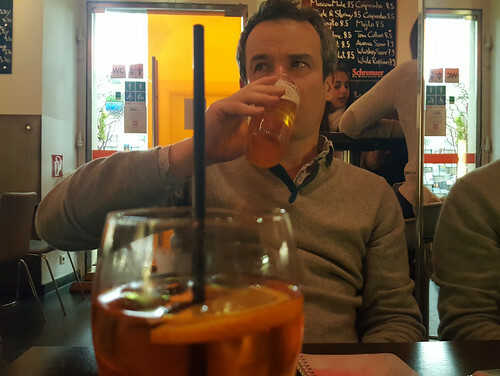 The little bar itself was relatively unoccupied, so we found a seat in there to have beers/Aperol spritzes. The atmosphere was lively, and you could tell everyone was in the mood to celebrate the proper arrival of spring, even though it was only Tuesday. We enjoyed our drinks and wandered home, content. This entry was originally posted at https://nanila.dreamwidth.org/1148171.html. The titration count is at .0 pKa. I think they know a lot of people go to the morning exercises and don't intend to attend the evening performances. I would've liked to take at least one photo of the kids in the building itself and not the horses. But they were very serious about patrolling the seating areas and telling people off, and repeatedly announcing that photography was forbidden. So I respected that. Years and years and years ago you were still allowed to take photos of the horses. We dragged my dad in to see the exercises back then - he wasn't amused! I suspect they've stopped allowing it now that so many people can take such high-quality images just with their phones, let alone all those tourists wandering around with dSLRs and good telephoto lenses. Keiki looks SO much like his father, by the way! That resemblance is really coming through the older he gets. I think he still looks more like me than Humuhumu does (apart from her nose), because of his skin tone and super-dark eyes.